Not to be confused with Victoria Station. The railway station was rebuilt as the Victoria Terminus, named after the then reigning Queen Victoria. The station was designed by the consulting British architect Frederick William Stevens (1848–1900). Work began in 1878. He received ₹1,614,000 (US$22,000) as the payment for his services. Stevens earned the commission to construct the station after a masterpiece watercolour sketch by draughtsman Axel Haig. The final design bears some resemblance to St Pancras railway station in London. GG Scott's plans for Berlin's parliament building had been published four years before, and also has marked similarities to the station's design. The station took ten years to complete, the longest for any building of that era in Bombay. This famous architectural landmark in a Gothic-revival style was built as the headquarters of the Great Indian Peninsular Railway. During it's construction, a marble statue of Queen Victoria was installed in the main façade of the building, in a canopy under the clock. In the 1950s, authorities had begun to remove statues of the British figures from government buildings and public spaces based on a directive from the Government of India. Most of the statues, including that of Queen Victoria, were sent to Victoria Gardens (later renamed Rani Baug) where they were left lying on the grass in the open until at least the 1980s. A Right to Information report was filed, but had no records of the missing statue being exported out of India. Historians now believe that the statue was smuggled out, sold by politicians, or destroyed. The symbol of Progress, another statue featured on top of the dome, is often mistaken for that of Queen Victoria. The station has been renamed four times. It was originally known as Bori Bunder from 1853 to 1888. It was rebuilt as Victoria Terminus to commemorate the Golden Jubilee of Queen Victoria. The name of the station was again changed to Chhatrapati Shivaji Terminus in honour of Emperor Chhatrapati Shivaji, founder of the Maratha Empire. In December 2016 BJP government, the resolution to change the name to Chhatrapati Shivaji Maharaj Terminus was passed in the Maharashtra Assembly and in May 2017, BJP home ministry officially sent a letter to the state government denoting the name change, following which the station was yet again renamed as the Chhatrapati Shivaji Maharaj Terminus. However, both the former name “VT” and the current name “CST” are popularly used. On 26 November 2008, two terrorists entered the passenger hall of the CST, opened fire and threw grenades at people. The terrorists were armed with AK-47 rifles. One of the terrorists, Ajmal Kasab, was later caught alive by the police and identified by eyewitnesses. The others did not survive. The attacks began around 21:30 when the two men entered the passenger hall and opened fire, The attackers killed 58 people and injured 104 others, their assault ending at about 22:45 after they exited the station via the North FOB towards the west to Cama hospital back entrance. The CCTV evidence was used to identify and indict Kasab. In 2010, Kasab was sentenced to death for his role in the attack, and in 2012 he was hanged. The station building is designed in the High Victorian Gothic style of architecture. The building exhibits a fusion of influences from Victorian Italianate Gothic Revival architecture and classical Indian architecture. The skyline, turrets, pointed arches, and eccentric ground plan are close to classical Indian palace architecture. Externally, the wood carving, tiles, ornamental iron and brass railings, grills for the ticket offices, the balustrades for the grand staircases and other ornaments were the work of students at the Sir Jamsetjee Jeejebhoy School of Art. The station stands as an example of 19th-century railway architectural marvels for its advanced structural and technical solutions. The CST was constructed using a high level of engineering both in terms of railway and civil engineering. It is one of the first and finest products of the use of industrial technology, merged with the Gothic Revival style in India. The centrally domed office structure has a 330 foot long platform connected to a 1,200 foot long train shed, and its outline provides the skeleton plan for the building. CST's dome of dovetailed ribs, built without centering, was considered as a novel achievement of the era. The interior of the building was conceived as a series of large rooms with high ceilings. It is a utilitarian building and has had various changes required by the users, not always sympathetic. It has a C-shaped plan which is symmetrical on an east-west axis. All the sides of the building are given equal value in the design. It is crowned by a high central dome, which acts as the focal point. The dome is an octagonal ribbed structure with a colossal female figure symbolizing Progress, holding a torch pointing upwards in her right hand and a spoked wheel in her left hand. The side wings enclose the courtyard, which opens on to the street. The wings are anchored by monumental turrets at each of their four corners, which balance and frame the central dome. The façades present the appearance of well proportioned rows of windows and arches. The ornamentation in the form of statuary, bas-reliefs, and friezes is exuberant yet well controlled. The columns of the entrance gates are crowned by figures of a lion (representing Great Britain) and a tiger (representing India). The main structure is built from a blend of India sandstone and limestone, while high-quality Italian marble was used for the key decorative elements. The main interiors are also decorated: the ground floor of the North Wing, known as the Star Chamber, which is still used as the booking office, is embellished with Italian marble and polished Indian blue stone. The stone arches are covered with carved foliage and grotesques. Internally, the ceiling of the booking hall was originally painted blue, gold and strong red on a ground of rich blue with gold stars. Its walls were lined with glazed tiles made by Maw & Co of Britain. Outside, there are statues representing Commerce, Agriculture, Engineering and Science, with a statue representing Progress on the central dome of the station. CSMT has a total of 18 platforms—seven platforms are for suburban trains and eleven platforms (Platform 8 to Platform 18) are for inter city trains. Duronto, Garib Rath and Tejas Express leaves from Platform 18. Air-conditioned dormitories were inaugurated at CSMT on 16 April 2013. The facility has 58 beds for men and 20 for women. The station has been the location of filming the "Jai Ho" song in Slumdog Millionaire; and Ra.One. ^ a b c d e f g h i "Chhatrapati Shivaji Station". World Heritage Site. www.worldheritagesite.org. Retrieved 3 December 2008. 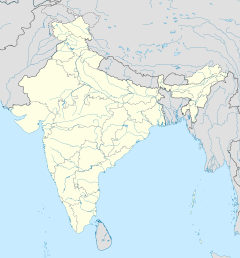 ^ "India's impressive railway stations". Rediff.com. 13 October 2011. Retrieved 4 January 2013. ^ a b "Advisory Body Evaluation: Chatrapati Shivaji Terminus" (PDF). ^ "CST's Victoria missing without a trace". The Indian Express. ^ a b c W, Christopher (2002). Bombay Gothic. London: India Book House PVT Ltd. ISBN 81-7508-329-8. ^ "Suresh Kalmadi – Work Profile". Retrieved 21 March 2011. ^ "Suresh Kalmadi – In Conversation". Retrieved 21 March 2011. ^ "Mumbai travellers, CST is now Chhatrapati Shivaji Maharaj Terminus". Hindustan Times. 8 May 2017. Archived from the original on 3 July 2017. ^ "Mumbai Railway station renamed to Chhatrapati Shivaji Maharaj Terminus - Times of India". indiatimes.com. Retrieved 1 February 2018. ^ a b "Photographer recalls Mumbai attacks". The News International. 16 June 2009. Archived from the original on 17 June 2009. Retrieved 17 June 2009. ^ "6 dead, 31 injured as 'Kasab bridge' in Mumbai collapses". OnManorama. Retrieved 15 March 2019. ^ "Microsoft Word - IND 945 AN.doc" (PDF). Retrieved 26 March 2013. 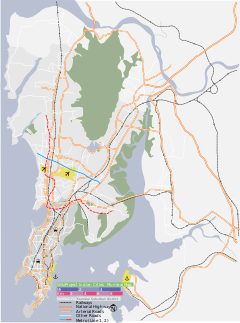 ^ "Mumbai CSTM Station - 24 Train Departures CR/Central Zone - Railway Enquiry". indiarailinfo.com. Retrieved 1 February 2018. ^ "Dormitories for women at CST, LTT get good response". Indian Express. 19 April 2013. ^ Outlook Publishing (6 October 2008). Outlook. Outlook Publishing. pp. 69–. Retrieved 7 November 2011. ^ "3,500 VFX shots in RA.One". Mahiram. n.d. Retrieved 7 November 2011. Wikimedia Commons has media related to Chhatrapati Shivaji Terminus (formerly Victoria Terminus). This page was last edited on 23 April 2019, at 14:41 (UTC).